The 16th international confrontation of the world’s best sparkling wines, Effervescents du Monde®, organised by Forum Oenologie, was held on 14, 15 and 16 November 2018 in « the Castel » Pavilion, teen house of the famous Gustave Eiffel, today Lycée Le Castel culinary school in Dijon (Burgundy), France. Compliance with the international wine competition rules and strict application of the ISO 9002 Quality Assurance standard. Guaranteed implementation of scoring criteria for international competitions. Rigorous selection of the panel of expert judges, based on experience, diversity of backgrounds, professionalism, determination of their sensorial profile and training in tasting methodology. Annual assessment and grading of each taster. Faultless, quality-driven organisation: limitation of the number of wines per judge, ideal tasting conditions (sensory isolation, proper tasting rhythm, etc.) and secure computer processing of results. Differentiated analysis of the foam (visual) and the effervescence (tactile) of wines. To award reliable and thus representative medals each year, reflecting the founding motto of the Effervescents du Monde® competition: diversity, quality and high standards. After three days of work, the judges awarded a total of 196 medals. * Some wines are rigorously equal thus the TOP 10 2018 includes 14 wines. The Top 10 ranking has a strong international diversity: South-Africa, Argentina, Brazil, France, Italy, Moldavia and Switzerland. Wide representation from all the sparkling wine regions (AOC) in France, as well as from the major highquality standard sparkling wine (VMQ) and sparkling wine (VM) producers. The entries included wines made both with and without aromatic varietals, using traditional, ancestral or Charmat-type closed-tank methods. 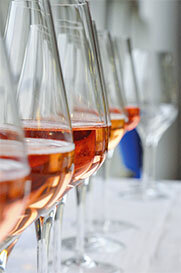 50% of the wines in the competition were from France, splitevenly between Champagne and non-Champagne. There was also strong participation from Argentina, South Africa, Chile, Spain, Italy, Brazil, Hungary, Moldavia, Portugal and Switzerland. Canada, Peru and Russia entering into the competition. In France, the areas of Alsace, Limoux, Burgundy, Bordeaux, Val de Loire, Champagne Appellation and the standard Sparkling Wine (VMQ) are significantly represented. Some real discoveries were made, thanks to the tasting of rosé and red sparkling wines made with the traditional method, wines made with the ancestral method, sparkling wines made from aromatic varietals and sparkling ice wines. Low-alcohol sparkling wines also drew notice. According to the expert judges, the wines displayed extraordinary variety and richness, with complex flavours and a great deal of finesse. Red and rosé AOC, VMQ and VM sparklings wines strongly increased their presence; they also won beautiful medals. With 22 countries, this international competition offered one of the strongest concentration of geographical sparkling wine diversity. The international expert judges observe a clear improvement of the quality for almost all the wines productions for AOC designation and Quality Sparkling Wines (VMQ). News english tasters joined the expert judges of Effervescents du Monde. In 2018, Brazil, Spain, Italy and Switzerland obtain many medals. These countries are very closely followed by South Africa, England, Hungary and Slovakia. France obtains very many medals thanks to the strong and very noticed participation of Champagnes, Alsace and Burgundy Crémants and also of the standard Sparkling Wine (VMQ). The Effervescents du Monde® competition is organised by the Association Forum Œnologie, in participation with the Revue des Œnologues and in partnership with the Castel Culinary School (Dijon, France), which acts as the sensory performance assessment centre for the expert judges, and hosts the competition. During the tasting, the wines were served with active participation from students in the Wine Steward class. The Services Actions Qualité company handled computer processing of all data and results from the competition. The 17th Effervescents du Monde® confrontation will be held on 13-15 November 2019 in Dijon. The Effervescents du Monde® competition was certified by the DGCCRF (French consumer-protection agency) and by the EU on 21 May 2003.